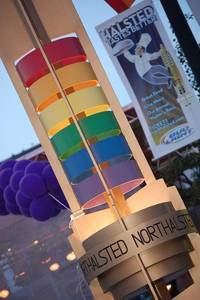 Image from the Chicago Pride webpage. This photo mosaic contains over 10,000 photos of Chicago’s Pride Parade over the last decade. President Bill Clinton deemed June ,“Gay & Lesbian Pride Month,” in 2000. June was chosen as a remembrance for the Stonewall Inn riot in Manhattan in 1969, which is considered the start of the LGBT civil movement in the U.S. The movement has several goals such as promoting pride of sexual orientation and gender identity, thinking of the diversity of sexuality is a gift to humanity, and engaging with the idea that sexual orientation & gender identity are inherent and cannot be changed. For some more information on the history of Pride Month, check out the National Women’s History Project website. To celebrate Pride Month at ECC, we have included some books about LGBT perspectives and issues from our library. Also check out the information about Pride in Chicago – the website includes dates and times for festivities occurring throughout June – including the annual Pride Parade.